At this time of year there are a lot of things to harvest, including dye plants. Some things can be strung up to dry, such as marigold blossoms. 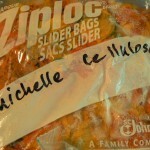 Other things, such as orange cosmos flowers, I store in the freezer. When the first cosmos were ready to pick a few weeks ago, I realized that our freezer was still full of bags of cosmos I froze last summer! So on September 1st I decided I’d better make some room. Cosmos are easy to distinguish from pesto, ginger, and the other non-commercial items in our freezer, which is lucky because I had re-used zip-lock bags last summer and you can see that the labels weren’t helpful. This is not good practice. 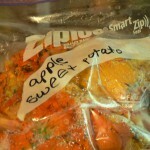 Label your bags accurately! It is probably also not good practice to store food and non-food things in the same freezer, but we only have one freezer so that’s how it is. I made a very strong dyebath using 5 lb. of frozen orange cosmos flowers. 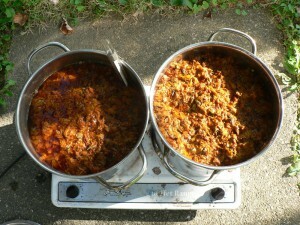 Since my pots are pretty small, I divided the quantity between two 2-gallon pots, and ran two baths simultaneously. Orange cosmos are pH sensitive, and you get much redder colors if the pH is high. After straining out the flowers, I used ammonia to increase the pH. I have run out of pH test strips at the moment so I can’t tell you exactly what it was. In the initial dyebaths I added 4 Tbs. ammonia per pot (about one and a half gallons of liquid) before adding the yarn. For each subsequent exhaust bath I added 2 Tbs. ammonia. The yarn is 4 ply rug wool (Helsingin Villakehraamo from Finland, bought at the Hill Institute a few years ago), premordanted with aluminum sulfate.